London – Tuesday 21st April 2015 – Sam Allan, one of the UK’s most successful professional Kick Boxers, is set to make the transition to the pro boxing ranks this coming Saturday, when he takes on Middlesbrough’s unbeaten Chris Wood on the Rivals Promotions event in Wishaw, Scotland on April 25th. 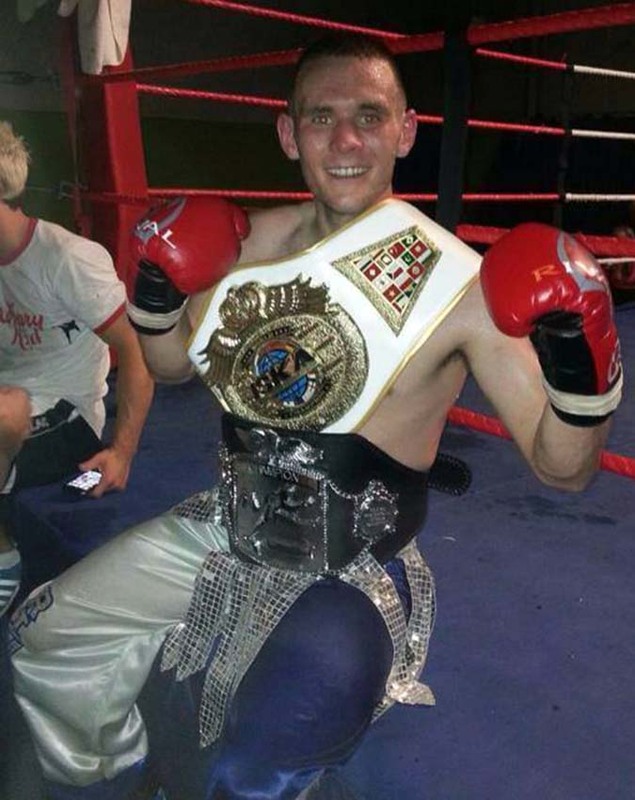 Sam, who first began Kick Boxing when he was just five years of age, secured his first World title as an amateur at the tender age of thirteen and successfully defended the crown on numerous occasions before turning pro in 2011. Since turning pro as a Kick Boxer Sam has had fifteen bouts, winning them all, including a World title unification bout against America’s then WKA World Champ Bobby Campbell in August 2013. Sam, who was just twenty two years of age at the time, showed a maturity that belied his tender age, the youngster knew exactly what he had to do and with his brother Scott in his corner, executed his game plan perfectly, so much so that after twelve sensational rounds he became the first person to unify the ISKA and WKA championships and what’s more it was via a unanimous points decision. Sam’s opponent, Chris Wood, who only recently turned pro himself, comes into the bout with a first round stoppage win over Latvia’s Edgars Milevics. Facing an unbeaten opponent on his pro boxing debut clearly doesn’t faze Sam at all, as he made abundantly clear when he spoke earlier about Saturday’s upcoming fight. “This just kinda happened, my brother Scott turned professional last year, so when my dad wanted to do a pro boxing show here with Scott it seemed a good time as any for me to turn pro. We’ve got the same friends and they were having to go to different shows, because when I was fighting, he’s not and the other way around. This time they will be able to watch us both fight on the same show. The different style of fighting isn’t a problem, a punch is a punch and since my last fight I have been preparing for this, I’ve been working a lot on the bags and pads and had good sparring, I’m a fighter and do what I need to do. I don’t know much about Chris Wood, I’ve heard he likes to fight, that’s good, I like to fight as well. The fans are going to love it, it’ll be a real fight not a stand-off, the fans want to see real fights, a bit of a tear up, yeah they’ll love it. The fans deserve good fights, without them we wouldn’t get to fight as often, on Saturday they’ll get a good fight that’s for sure. 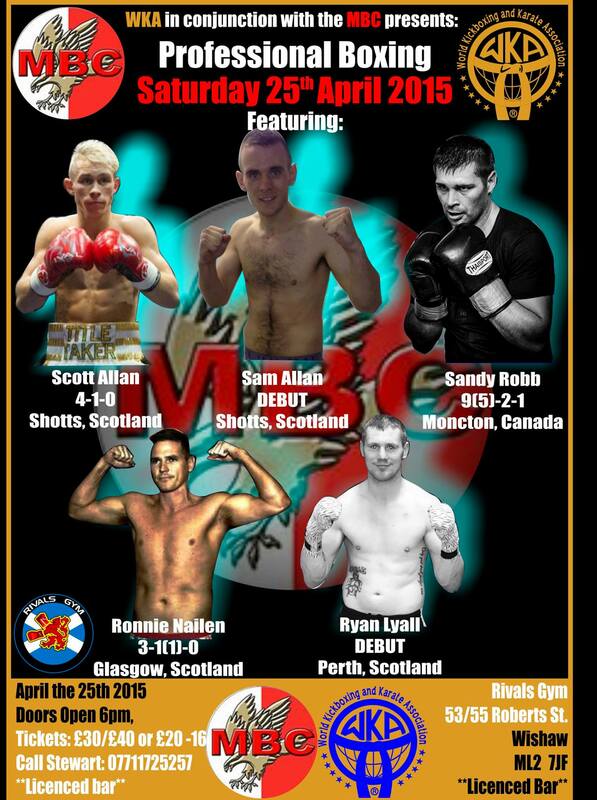 Sam Allan versus Chris Wood features on the Stewart Allan (Rivals Promotions) event at the Rivals Gym in Wishaw, Scotland on Saturday 25th April 2015.